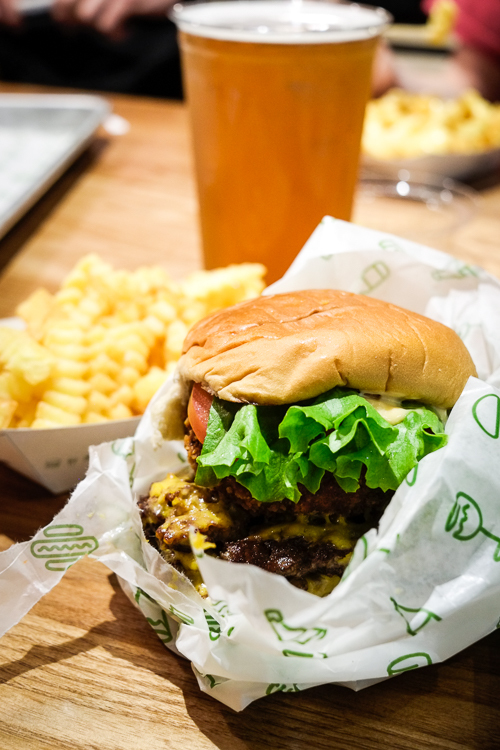 US-born burger chain Shake Shack began its life in 2001 as just that. A shack. Selling shakes. Or more exactly as a hot-dog cart in Madison Square Park, New York. Selling hot-dogs, burgers and shakes. 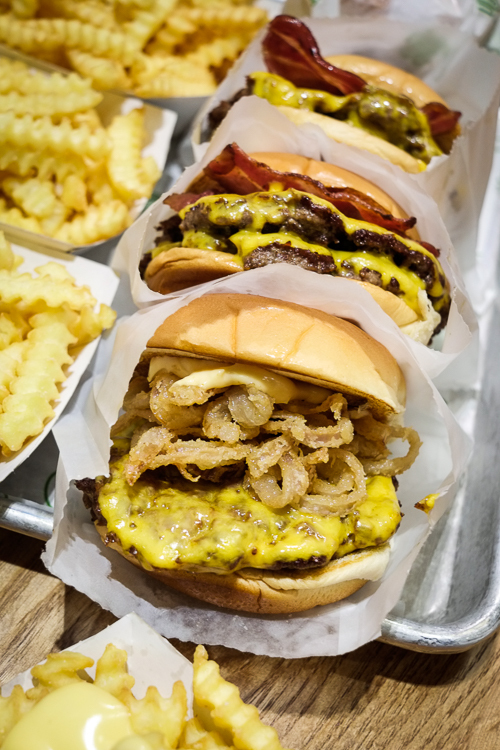 It was such a success that the brand now has scores of hip gourmet burger joints all over the US plus Japan, Russia, Dubai – and now it’s come to Cardiff, the first UK Shack outside of London. Well, croeso Shake Shack; welcome to Wales. And thank you for choosing us. Conveniently situated in St David’s Shopping Arcade it’s a perfect post-shopping stop off point when you’re craving a tasty burger – with a side of style. We rolled up on a late Sunday afternoon (myself, hubby and two sons) and were greeted by staff who were smiley, helpful and who looked like they wanted to be there (I guess that’s American service for you). You order, then you’re given a hand-held gadget to take to your table, which flashes when your food is ready to collect. Burgers at the shack are made with grass-fed 100% Aberdeen Angus beef – and the quality shows. We all agreed they tasted scrummy, had just enough bite and didn’t feel fatty in the mouth. We chose a ShackMeister (cheeseburger with crispy ShackMeister Ale-marinated shallots, £6.50), a Smoke Shack (cheeseburger with British free-range Wiltshire-cured smoked bacon and chopped cherry pepper, £7.50) and a Shake Stack (cheeseburger topped with a crisp-fried Portobello mushroom filled with melted cheese and topped with lettuce and tomato, £8.75). All come with Shack Sauce (a kind of mix of sweet and sour mayo, ketchup, mustard and spices) and are served in a potato bun which is squishy enough to fit comfortably into your mouth but not so floppy that it collapses because it can’t handle its filling. Fries are crinkle cut (£3) – and I can recommend my son’s choice of topping them with cheese (£4) – creamy with no hint of greasiness. The food comes with no frills – it’s packed in greaseproof paper and served on a tray as you’d expect from any fast-food outlet – but you can add panache to the occasion with a glass of wine, no less. Or maybe a pint of ShackMeister Ale or some craft Welsh beer is more your thing. Of course the shakes are also good and you have to try a ‘concrete’ for dessert – frozen custard ice cream blended with mix-ins like peanut butter sauce, Welsh cake and hazelnut chocolate brownie. Whilst this isn’t the cheapest burger-meal you’re ever going to buy, the quality is a bite-above your usual fast-food and the restaurant has a chilled-out laid-back atmosphere where you’ll like to linger. Byrgyrs am byth! We’ll be back for more soon.